TextPipe™ Lite searches and replaces your entire website (even millions of files!) quickly and easily! Loved by home users, webmasters and novice computer users alike! TextPipe Lite provides a range of very powerful filters at a greatly reduced cost. The Lite edition provides End Of Line conversion between DOS/Mac/Unix files. If the Lite edition does not fully meet your needs, the Standard Edition or Pro Edition can be purchased as a form of upgrade. Powerful editing control - Restrict replacing to just inside HTML tags like the TITLE tag, META tags, inside the ALT text of Image tags, META tags and more! No limit on file size! Even files over 10GB are handled! TextPipe runs on Microsoft® Windows® 10, 8, 7, Vista®, 2016/2012/2008/2003 Server, XP x32 and x64. We also provide Professional Services and can tailor TextPipe to suit your requirements. 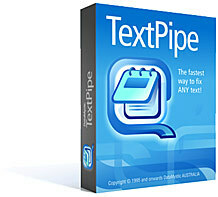 TextPipe Lite was formally known as TextPipe Web and DropConvert.